Having dinner at The Earl of Thomond Restaurant at Dromoland Castle Hotel & Country Estate in Newmarket-on-Fergus in County Clare, Ireland is a regal affair. Elegance prevailed the moment that we stepped through the entrance into The Earl of Thomond Restaurant at the famous castle dating to 1543, where the strains of harp music welcomed us to the stunning dining room. Soaring ceilings with intricate crown molding and crystal chandeliers, Gothic carved wood wainscoting, period wallpaper, white marble fireplace with samovars on the mantle, portraits of the former owners, the O'Brien family the Barons of Inchiquin, decorate the walls, bronze sculptures arranged throughout the room, and the last rays of sunlight coming through the large windows framed with lace and opulent gold and teal velvet window treatments, added to the rich textures of the dining experience. Our table was draped with pristine white linens with white Celtic designs and matching napkins, with a red rose and baby's breath in a silver trumpet vase, and a tall white taper in a silver candlestick. 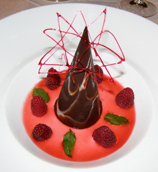 Edward F. Nesta and I had dinner at The Earl of Thomond Restaurant in September 2007, and were amazed at Executive Chef de Cuisine David McCann's creative menu, which listed fifteen selections on the Table D'hôte menu and twelve main courses. Naturally we wanted to sample everything, but prudence triumphed and we settled on four selections from the Table D'hôte menu for our starters and intermezzos. 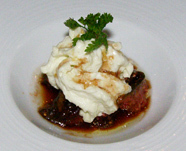 To begin our experience at The Earl of Thomond Restaurant, Chef David sent us an Amuse Bouche of Marinated Figs in Balsamic with Bleu Cheese Foam. Paired with a young and fruity Clef de Sol 2005, Chenin Blanc, Montlouis from Loire, with mineral notes and quince on the palate, the Amuse Bouche whetted our appetites for what was yet to come. For his first course, Edward began with the Terrine of Foie Gras Paysanne, Baby Figs and Beetroot, which was beautifully presented as party pretty stripes of flavor and color, served with a mixed salad, with concentric circles of sauces. I selected the Seared Sea Scallops, Saffron and Quince Puree, with Madras Garnish, which was a gorgeous presentation and delivery of scallops seared to perfection wearing a crown of watercress, with golden sultanas and caramelized crunchy almonds adding texture, and a delightful marriage of saffron and quince. As an intermezzo, Edward selected the Carrot and Leek Soup with Coriander, which was rich and full of flavor with a very nice coriander finish. I had the Gin and Lime Sorbet, which had a smooth and creamy texture and tasted like a delectable frozen Lime Rickey that was served in a martini glass. Edward continued with Local Loin and Cutlet of Lamb with Tomato and Herbs, Buttered Greens, Aubergine Caviar, and Tarragon Sauce, which was another stellar course in Chef David McCann's arsenal, especially when paired with a delicious 2005 Bordeaux. 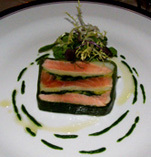 I had the Crispy Pave of Organic Irish Salmon, Potato Rosti, Organic Leaves, Cucumber, and Tarragon Sauce that was artistically presented with cucumber carved to resemble "peas" and accompanied with shaped new potatoes. The Dessert Menu listed nine creative desserts plus a Selection of Irish Farmhouse Cheeses, however Edward has a dedicated addiction to all things chocolate, especially dark chocolate, so making a dessert selection for him was a breeze when he saw the Rich Valhrona Chocolate Cone with Bailey's Mousse Centre, and Red Berry Coulis, which lived up his high expectations. I have a passion for exotic ice creams, and when I saw Elderflower Ice Cream on the menu, I indulged in the Trio of Sorbet with Fresh Fruit and Biscuit Tuile, and was delighted with the rich flavor of the ice cream. Dromoland Castle Hotel & Country Estate is a place for romance and celebrations, so it was no surprise that the night that we dined at The Earl of Thomond Restaurant, there were three couples celebrating their anniversaries and two people celebrating birthdays. What especially touched my heart were a couple named Edward and Philomena who were celebrating with their family. It seems that they had just returned from their 50th anniversary celebration in Rome, and were now continuing the celebration at Dromoland. When we congratulated them on their good fortune, Edward invited us to join them in the Lounge for a "Jamey" (Jameson Irish Whiskey), and to listen to the guitarist, Kate. Now how could we refuse an offer of the heart? 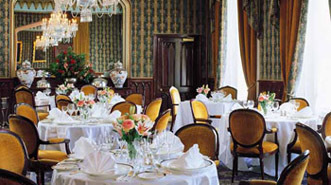 In a word, the experience at The Earl of Thomond Restaurant and Dromoland Castle Hotel & Country Estate was memorable. Please read other articles on Dromoland Castle Hotel & Country Estate in the Hotels and Resorts, Spas sections and Chefs' Recipes where Chef David McCann shares a few of his innovative recipes. Please read other articles on Ireland in the Destinations, Hotels and Resorts, Restaurants, Chefs' Recipes, Spas, Liquor Cabinet: Celtic Crossing Liqueur, Boru Vodka, Knappoque Irish Whiskey, Fashion, and Adventures sections. © October 2007. Luxury Experience. www.LuxuryExperience.com All rights reserved.